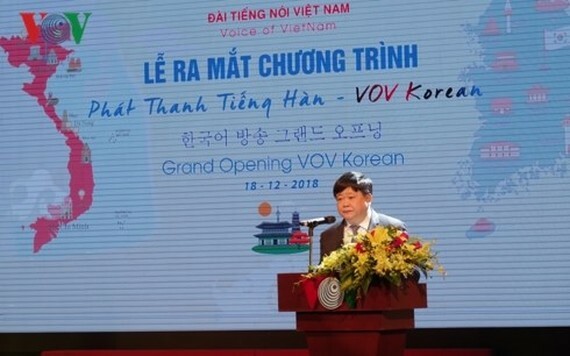 The Korean-language programme of Radio the Voice of Vietnam (VOV Korean) was launched in Hanoi on December 18 in celebration of the 26th anniversary of the relations between Vietnam and the Republic of Korea (1992-2018). Director General of the VOV Nguyen The Ky said the airing of programme demonstrates the development of the news department for foreign service and the VOV in general. He asked the department to strengthen coordination with others to improve the quality of the programme which will serve as a bridge to connect with the Korean community in Vietnam. This also helps enhance the comprehensive cooperative partnership between the two countries as expected by their governments and peoples, he said. The programme covers political news, commentaries, lessons on Vietnamese and Korean, culture, ethnicity, tourism, and economy. Earlier on March 15, 2018, the VOV launched a Korean version on its website, the 13th foreign language.